aged from 6 to 18 years old. that have not been before. We are a Norfolk based club that was started by a local family. We are now run by a committee and are a member of the ACU. We are very lucky to have a dedicated site for training and race meetings. Our track is approx. 340 metres which is about the same as King's Lynn Speedway track. We hold youth only meetings with the added fun of a fathers race most meetings. We can offer training for all abilities, contact us for details. please complete and support the club. 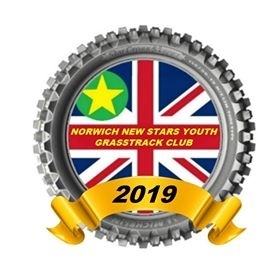 Norwich New Stars Spring News Letter. Welcome to a new season of grasstrack racing. We would like to thank all the volunteers who give their time and expertise through the year, parents for supporting the children and of course the riders whose enthusiasm and enjoyment is infectious. Training dates: We are planning to invite some experienced riders to share their knowledge with you this year. So watch this space. We are pleased to announce that Club Membership for Training is again £10.00 for the year and is required for each child that trains with NNS. A supporter’s membership is available for a suggested donation of £5.00. Due to the increased cost of holding a race we are requesting that payment has to be made in advance of a race meeting. We can accept payments by paypal, cheque, cash and direct bank transfer. Racing regs will be available nearer the time to download and can be emailed back. We need to know who is attending a race a week before as we need to order the trophies and pay for the first aid cover. Late entries or entries with no payment may not receive their trophy on race day. Please contact us to enter our next race meeting or for training information. We offer family friendly race meetings to all riders no matter their racing experience. It is a great meeting to see the youth ride, these are the riders of the future. You can help support the club by sponsoring a race meeting from as little at £30.00. We will post your company on our website, facebook page and print your details in our program. We can advertise your logo at our venue.